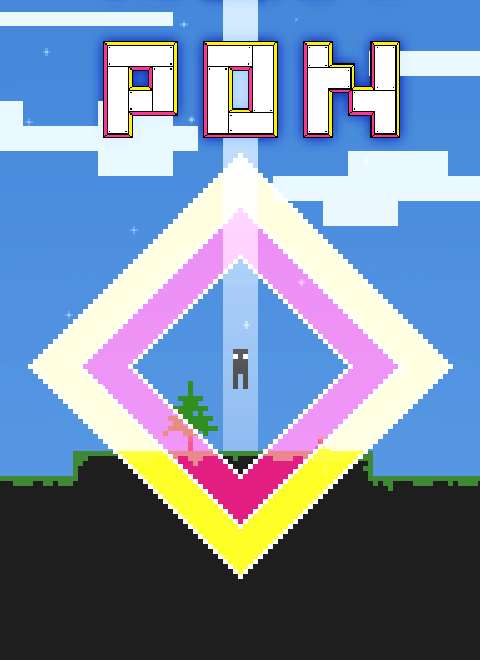 Pon is a pixelated adventure game. You play as the main character Pon who goes on a epic journey. This is not a point and click game. The mouse is only used for the inventory and the puzzles. Inventory with items and a wide range of different clothes. A saving system that automatically saves the player position and the items in the backpack. Some things will only be available during specific times in the day. Q - Which keys do I need to know? A - Arrows = Movement, I = Inventory, R = Restart, Space = Use/Interact. Q - How do I use clothes? A - You start with no items in your inventory. If you find/buy a item, press I to bring up the inventory and then press the cloth you want to use. Click it again to take it off. Q - What are those big smiling blocks? A - They are placed there to stop the player from going to a place (frame) that does not yet exist to prevent unnecessary restarts. Q - What will it cost when its done? You can now download the updated version with a proper save function and more speech bubbles explaining stuff. Press O to save and P to load. Not really much more to say. It's not perfect but I hope and think it should do it. Please report all bugs. Also, it does not save if you have clothes equipped, they will go to the backpack if you load. I wanted to make some more graphics but since that would cause me to miss the Friday deadline, I decided to included in the next update that is set on unknown time but I promise it will include more playtime, more graphics ,more quests and less bugs. A update, that will fix and add lot of things, will arrive this Friday. It is finally done! The release version 1.0 is available for download. Second alpha release and plans for the next! The second alpha release (046), some pictures and what to expect in the next build. The fist alpha version is released to give a little sample of how it works and feels. Updated version with a save function and more speech bubbles explaining stuff. Pon the full version swiff file that should work for all operative systems that can run swiff (flash) files. Read the release news for info. Pon the full version for Macintosh. Read the release news for info. Pon the full version for Windows. Read the release news for info. A couple of new places and a lot of new objects added. Try it out now! The first official release, a little taste sample of what to come. For Windows and OSX. hi i have a problem with downloading. can i have another downloading site? game front ALWAYS tells me that i'm forbidden from downloading anything from it. I've just got back from the moon, and I'm probably being silly but I literally cannot work out what to do next. Any pointers? EDIT: Seems there was a bug that made one of the coins not appear. Restarted and it's fine. Then you should have received the blowtorch which you can use to melt the frozen guy. Wow Im talking alot, anyway Ive noticed a few things. 1. What is that bottle thing you can pick up for? 2. What are you supposed to do with that puzzle thing in the castle? 3. How come the monster doesnt come out at 00:00 like it says? 4. Why cant we buy the plunger? I want to. 1. If you open your inventory (I key) and press it, you will get faster. 2. Solve it and press space to open the door. 4. It's locked for the moment but will be available later. How do you solve it? I couldn't rotate the tiles at all. That's strange. It should do just by clicking them to make them change place. I also had this problem once - the 1st time I came to the cave I was able to solve the puzzle with no problems. Then I started game again, came to the cave and the puzzle was not reacting the mouse - the peaces just did not move - I could do nothing but to restart. That was 1.0 version, did not try 1.1.
how come I cant play the new version? If none of the solutions above helped you, please write again and describe the problem further. I downloaded Flash and Shockwave but when ever I click on the swf file in the download it says it doesn't know what to use to open it. Does this have anything to do with the fact that the file is named _MACOSX? Lol after about an hour of experimenting I used internet explorer to open it and it worked.